Conditions the eye area, while gently removing makeup. Eye Q's Eye Makeup Correctors come to the rescue of eye makeup mishaps / smudges. These 100% cotton swabs are pre-moistened with an oil and fragrance-free cleanser. The gentle formula leaves no greasy residue and is ideal for contact lens wearers. 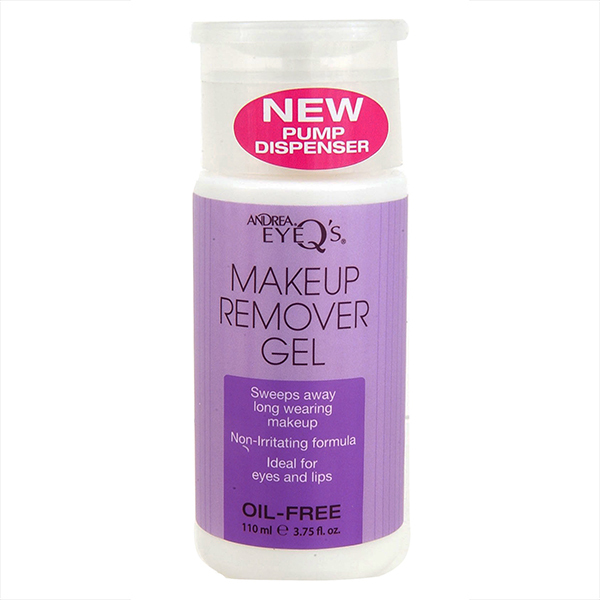 Andrea Eye Q's Makeup Remover Gel "Gel Demaquillant" (3.75 fl.oz 110 ml) is made for Combination or Oily Skin. This Oil-free formula sweeps away long lasting eye and lip makeup without leaving greasy residue. The gel is non-irritating and contains Panthenol to condition lashes and Grape Seed Extract to help keep delicate skin around the eye area smooth and soft. Ideal for those who wear contact lenses or have sensitive skin. Moisten a fresh cotton pad with water and wipe dispenser clean after each use. ANDREA Eye Q’s Hydrating Make-Up Remover Gentle Lotion is made for Dry or Sensitive Skin (3.75oz/110ml). This 2 in 1 lotion is a cleansing lotion that sweeps away makeup while cleansing debris from the face. Formulated with cucumber to cool the skin and reduce irritation. Andrea Eye Q's (Original Formula) Moisturizing Eye Makeup Remover (65 Pads) conditions the eye area while cleansing. Andrea Moisturizing EyeQs formula gently removes all make-up, conditions and moisturizes the delicate eye area to help prevent the formation of fine lines, and leaves lashes soft and beautiful. Andrea Eye Q's Oil-Free Eye Make-up Remover Pads (Contains 65 Pads) quickly and effectively remove eye makeup. These oil-free pads are a must have for lash wearers for cleansing the eye (orbital) area before lash application. Andrea Eye Q's Ultra Quick Makeup Remover Pads (Contains 65 Pads) quickly and effectively remove long wearing and waterproof eye makeup. This ultra gentle formula is formulated with aloe vera and botanical extracts. These soothing pads are ideal for those who wear waterproof eye makeup or have sensitive eyes. Effectively removes all traces of latex and nitrocellulose eyelash adhesive residue. Andrea Modlash Eyelash Curler helps you create beautifully upswept lashes easily and expertly. The unique design fits close to the lash line for maximum curl. Perfect for blending false lashes for a more natural look. Pair with Andrea Lash Curler Refills. Easy application instructions printed on the back. Click on Image for more information about this Starter Kit. 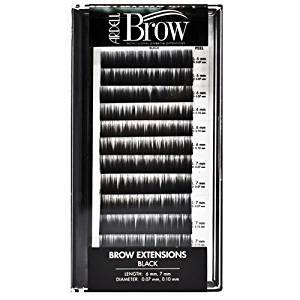 Ardell Brow & Lash Comb helps groom brows and separate lashes. Using the brow side of the comb, brush upward and out to enhance the natural shape of your brow. Using the eyelash side of the brush, start at lash line and comb upwards to separate and lengthen lashes. A very useful makeup tool!